Today we breathe. Tomorrow we push. In the last few weeks, we have experienced the national drama of Brett Kavanaugh’s confirmation in our bodies, under our skin, within the trauma of memories, our own and others. Many of you broke your silence and told your survival stories, called senators and protested in halls of power. We tended to one another’s pain and rage and grief in the streets and in the quiet corners of our classrooms and homes — and still he was confirmed. We are tired and raw, and we have reason to feel hopeless. Dr. Christine Blasey Ford’s courage and the voices of millions of women and allies were not enough to prevent an alleged abuser from a lifetime appointment to the highest court in the land. Kavanaugh was entitled to due process. But this was not a trial — it was a job interview. The vote was not a verdict, it was promotion to a position of unparalleled power. His rushed confirmation sent a message to the nation that women’s voices do not matter. We are mobilizing the vote this midterm elections with our partner #LoveArmy and a broad coalition of artists and activists. Will you put wind at our back? Make a donation of $5/month now to fund the movement! Now the new Supreme Court — the most conservative court in nearly a century — will make the labor of justice for women, poor people, and people of color in America harder and more painful, not for years but for decades to come. But we know how to labor, in our bones and in our blood. On the day of the vote, I went to the sea to breathe. 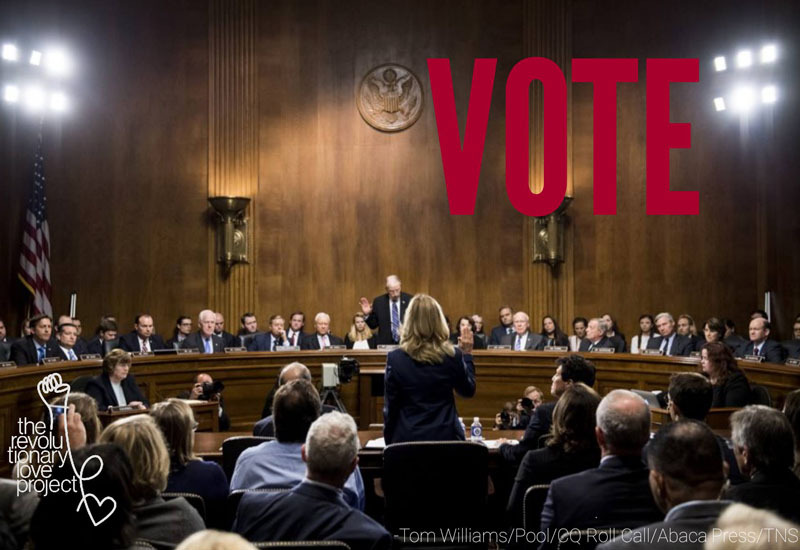 I felt the pain of this defeat in multiple ways — as a woman who has survived sexual assault, as a lawyer and fellow alum at Yale Law School who protested Kavanaugh as unfit, as a former clerk on the Senate Judiciary Committee who remembered the hardship of being a woman and woman of color in the Senate, and as a mother who is seven months pregnant. I wanted my daughter to be born in a nation where women and girls are believed. I lifted my eyes to the horizon and thought about the suffering and survival of indigenous ancestors who had lived on this land for thousands of years before this nation was founded. I thought about how American institutions, built on genocide, occupation, and enslavement, were designed to consolidate power among white Christian property-owning men. The nation was simply not built for the flourishing of indigenous people, black and brown people, queer and trans people, poor people, Jews and Muslims and Sikhs, or women and girls, as my friend angel Kyodo Williams reminds me. The founders of the nation invoked words whose power even they could not comprehend — freedom, equality, justice, and the guarantee of life, liberty and the pursuit of happiness. These words seized the imagination of the peoples for whom they were never meant, and in every generation, people like us rose up to labor for these words and bleed for those words. They dreamt of an America that has never been, yet still must be — a nation for all of us. The labor for justice has gone on for centuries before us and will go on after us. It is okay to feel hopeless in any given moment. Hope is a feeling that waxes and wanes. What matters is whether we choose to show up tomorrow — and labor anyway. Our task is not to complete the labor. Our task is to continue the labor, even if a Trump presidency and Kavanaugh confirmation now make this labor a lot longer and more painful than we ever thought it would be. The key is to labor in love. In the last few days, we have heard cries of outrage and attempts to mobilize voters for the midterms under the banner: “Make them pay!” It is essential that we honor our rage and hold Republican lawmakers accountable for this vote and for all the ways they have condoned sexism, bigotry, and tyranny under this presidency. But the energies of revenge and resistance will not sustain us in the labor. Our goal is not just to win the next election, but to deliver a new nation. Resistance will burn us out, or worse, turn us into what we are resisting. This election season, it is time to shift the frame of our movements from resistance to rebirth. Resistance points us to what we are fighting against, rebirth to what we are fighting for. Resistance narrows our focus to removing bad actors from power, rebirth expands our focus to remaking those institutions of power. Resistance marshals the energies of revenge, rebirth the energies of love. This is why I believe that Revolutionary Love is the call of our times: the choice to enter into labor for others, for ourselves, and for our opponents. I already see this love alive in our movement — in multiracial, multicultural, and multifaith spaces where you all are grieving together and raging together and caring for one another and still choosing to fight for justice in a way that does not dehumanize the other side. In these spaces, we catch a glimpse of the new America longing to be born. Now our task is to see whether we can harness this vision to remake institutions of power, starting this November. There is still the fact that we are tired. This is the time to remember the wisdom of the midwife: Breathe, then push. Breathe every day between now and the election: Honor your rage. Honor your grief. Breathe through the fire of these emotions with the ones you love. Breathe with the earth and sea and sky. Breathe with music and movement and joy. Breathe to summon the ancestors at your back. Breathe in order to remember all that is beautiful and good and worth fighting for. Then decide how you will push: Will you register voters? Drive people to the polls? Canvass neighborhoods? Because if enough of us choose to return to the labor right now, I believe we can begin to usher in a new era, where women are believed, where women lead, and where we are closer to delivering the America we dream for our children yet to come. Right now, we are mobilizing the vote this midterm elections. Donate here to help us push this November — and beyond. And thank you for laboring with us. We are mobilizing the vote this midterm elections with our sister organization #LoveArmy. Will you put wind at our back? Make a donation of $5/month now to fund this movement! Share this letter with anyone who needs some inspiration. POST this letter on Facebook. SHARE the art below on Instagram. 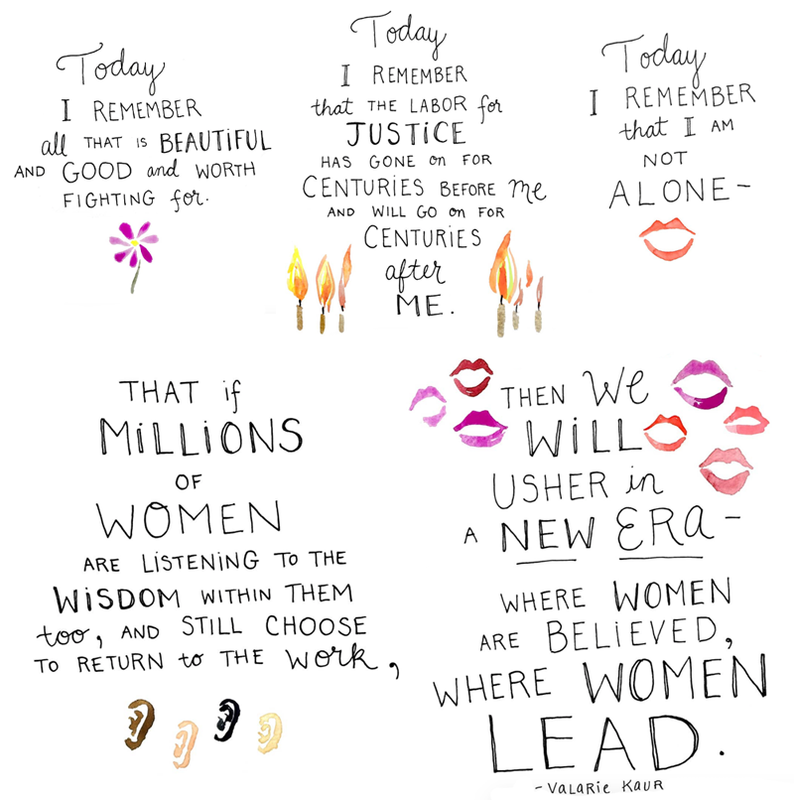 Thank you @kimothy.joy for art that brings the call of Revolutionary Love to life.